An engine that runs too hot does not last long. While your engine’s cooling system is responsible for regulating operating temperature, your exhaust system also plays a major role. Much of the heat energy of the combustion process is unusable and must be disposed of quickly. That is the job of all the piping and ducting that runs from the motor to the back bumper. Hot air and vapors are cleaned, cooled, and passed safely out of the rear pipe. Old worn out pipes with leaks and restrictions need to be replaced. We specialize in muffler repairs and can install custom exhaust systems that will hwlp keep your engine running at its best. Contact our Meineke #2394 in Walkertown, NC, for an evaluation. It's important for drivers to know the signs of a failing aftermarket exhaust system. The easiest way to tell if there's a problem is when your exhaust system starts producing a louder sound. This means there is a leak in your high performance exhaust system. Leaks are usually caused when the flexible weave of the exhaust system starts to rust. This is the most vulnerable part of your exhaust. If you've noticed that your exhaust is louder and you're worried about a leak, contact Meineke #2394 at Walkertown, NC. and we'll diagnose the problem and take care of any muffler repairs you need. A common question we receive at Meineke #2394 in Walkertown, NC, is whether fuel efficiency is really affected by the exhaust system. The answer is yes. Your exhaust system should include an oxygen sensor. This sensor is designed to detect the amount of oxygen that is coming through the entire exhaust system. It sends a signal to your engine to either increase or decrease the amount of fuel it burns to maintain maximum efficiency. However, if the oxygen sensor is defective, it can cause your vehicle to expend unnecessary fuel. Having your oxygen sensor changed every 60,000 miles can help eliminate this issue before it begins. Are you thinking of investing in a performance exhaust system, but you want to have more information first? There are several benefits to getting aftermarket exhaust installed on your car, including a more powerful engine. Performance exhaust systems for cars allow exhaust gases to flow more quickly and easily. Your engine can breathe more and perform better with the help of high performance exhaust. Another thing that many drivers enjoy about custom exhaust systems is the louder and more aggressive sound produced. If you want to learn more about installing a new exhaust system on your car, contact Meineke #2394 in Walkertown, NC. A car muffler is a very important component of your vehicle. When it needs to be serviced or replaced, you should bring your vehicle to Meineke #2394. 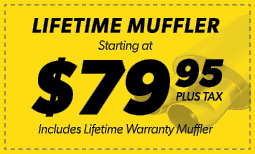 We know that time and muffler repair cost are important concerns, which is why our muffler shop is committed to making this a win-win situation for both you and your vehicle. Our affordable and wide selection of high performance exhaust systems, certified, knowledgeable and professional technicians and low prices make it easy for you to get your vehicle serviced by the best performance exhaust system experts in Walkertown, NC. Bring your vehicle into one of our many locations for a muffler inspection and performance exhaust estimate.